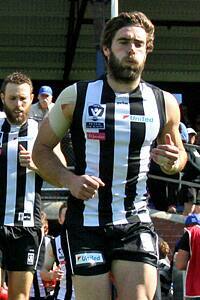 Jack Hellier leads the VFL Magpies onto North Port Oval in Saturday's Preliminary Final. Simply too good on the day. Collingwood's VFL season has come to an end after a 119-point loss to Footscray at North Port Oval. The Dogs kicked five goals to two in the first term and then added another six goals in the second as they raced ahead of the Magpies. Despite three consecutive goals before half-time, Collingwood couldn't hold on to any momentum. The loss marks the end of the decorated careers of Brent Macaffer and Alan Toovey, with the latter being a late exclusion from today's game with a back injury. Meanwhile, Footscray move to their second Grand Final in three years, with their opponent to be determined at North Port tomorrow. A 50m penalty put Lachlan Howe inside kicking distance at Collingwood's Williamstown Road end of the ground. The man who kicked three in the Qualifying Final made no mistake and gave first blood to the Pies. Two quick responses came from the Bulldogs as they showed their ability to quickly turn defence into attack. The match-up between Jarrod Witts and Will Minson in the ruck proves to be one that will have a huge impact in the result. Both were busy in the first term with Witts having the advantage in the ruck, yet Minson impacting around the ground. Footscray had the majority of the forward 50 entries in the first quarter, and seemed to score from most of their attack. Bailey Dale kicked his second at the 23-minute-mark to increase the lead to 20 points. The second quarter started the way it finished as the Bulldogs increased their lead. Will Minson kicked the first at the Williamstown Road end of the ground. Playing against his former side, Jordan Kelly received a heavy hit as he attempted to run from defence. Kelly was assisted by trainers as Brent Macaffer and Lachlan Ferguson led the remonstrations. A fourth goal of the quarter increased the lead to 44 points at the 20-minute-mark of the second term. Eight consecutive goals had gone the way of the Bulldogs as they continued to out-run and out-play the Magpies. AFL experience shone through 26 minutes into the second term as Adam Oxley, Tom Phillips and Brent Macaffer linked up to find Ben Crocker inside 50. Crocker kicked the resulting set-shot and ended a streak of ten straight Footscray goals. Just a minute later, Lachlan Howe marked in an identical spot and made it back-to-back goals for the VFL Magpies. The kick marked Howe's second goal of the game and fifth of the VFL finals series. Two in a row becomes three in a row seconds before the half-time siren. Jack Hellier's kick from 50m out bounced through an open goalsquare to record the VFL Magpies' fifth goal of the afternoon. An early goal to Tom Phillips made it four goals in a row for Dale Tapping's side. Momentum in the hands of the Magpies after Footscray have dominated the majority of the game. Footscray kick back-to-back goals to end Collingwood's mini run. The Bulldogs hold a 49-point lead 15 minutes into the third quarter. Two of Collingwood's eight goals have come from 50m penalties after the field umpire advances Gus Borthwick into the forward 50. Still facing a long kick towards goal, the tough midfield made no mistake and kicked the Magpies' third goal of the quarter. He wouldn't be high on the scouting report, but Ben Long has been key to Footscray's scoring efforts today. The small forward kicked his third goal midway through the third term after finding space up forward. Three big tackles in a row show prove there's no way the VFL Magpies are going down without a fight. Rupert Wills, Corey Gault and Gus Borthwick all put pressure on their Bulldog opponents. All Footscray in the final term with the fate of the VFL Magpies decided. Will Minson receives a round of applause and gives the Dogs faithful a thumbs up as he comes from the ground midway through the term. Alan Toovey watches on from the Collingwood coaches box as the realisation hits that he's played his last game of football for Collingwood. Toovey and midfielder Matthew Goodyear were late withdrawals today with back and calf injuries respectively. Meanwhile, his fellow retiree Brent Macaffer continued to fight until the final siren. Macaffer played the majority of the game in the midfield and failed to lower his colours in the disappointing loss. *Marty Hore is Collingwood’s 23rd player.